The 10th Leitrim Dowra Scouts Group exhibit their work at the International Scout Centre, Castle Saunderson during the G8 Summit. 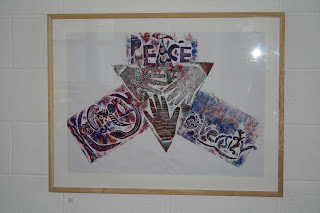 The Scouts chose 'Peace, Harmony and Diversity' as the theme for this exhibition which, for many, sums up considerations for the World Leaders at the G8 in Fermanagh. The hand is a universal motif - it is particularly relevant in our border area, the red hand identified as an emblem of Ulster. As for the Scouts, the three finger salute is universally recognised and hand images feature in its badges particularly in relation to 'skills' and 'community'. The work in this show is based on a collograph process, a way of making multiples of prints using raised surface pattern and texture. It culminated in the collective work represented in the large prints in the exhibition. This work is the result of Phase 1 of this project and Phase 2 will take the theme into three dimensional aspects and new processes. Artist facilitator Jim Fee says 'I found that certain Scout motifs as well as their ethos lent itself well to my initial response to the theme with triangular structures'. The final installation will be in place in August as part of the Life of Reilly Festival. Dowra is notably the first village on the river Shannon and sits in two Counties at its bridge, Leitrim and Cavan. This Scout Group is Leitrim based and they meet in Cavan with members residing in both Counties. This project is part of the Culture Cavan International Fund for Ireland initiative in association with Cavan County Council.